” MAN is born free; and everywhere he is in chains…” Thus begins Rousseau’s political masterpiece, “On The Social Contract.” Who would not want to shake off the chains and be free? The question is, what kind of freedom is Rousseau talking about, and what are these chains he refers to? Rousseau talks about two kinds of freedom, the freedom to act and the freedom to enjoy the fruits of action, both of which serve the goal of the preservation of life. The freedom to act is called “free will”; it differentiates men from animals and is directed by one’s desires. In the state of nature, the “free will” of men allows them to find creative sources of subsistence as the environment changes, and each is free to enjoy the fruits of his labor because he has labored independently. Aside from the realities of everyday survival, his unfettered life is a fairly happy one. This is Rousseau’s myth of the noble savage. In civil society, however, men must labor together and share their products. Compounding the problem, when men come to work together they begin to see differences between each other and these differences contribute to the formation of leaders and followers. With experience, one learns that those who lead obtain more plentiful shares of goods; so, driven by desires for pleasure, many will seek to become leaders, either by force or subterfuge. Under these new conditions, “free will” leads men to covet the fruits of anothers’ labor. The lack of protection of one’s freedom to enjoy his own creations puts the life of every member of the society at risk, and hence, in the civil society, “free will” has contributed negatively to man’s ultimate goal of the preservation of life. Rousseau seems to have calculated that the best bet for accomplishing preservation lay in the ability of the general will of the community to shackle the free will of individuals when in the public’s interest. 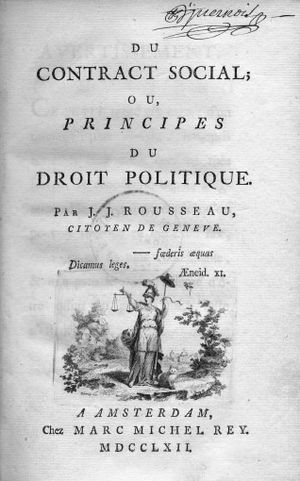 The “chain” Rousseau refers to in the famous opening line, therefore, is in fact “free will”, which was beneficial for the preservation of life in the state of nature, but detrimental to this goal in the civil society. Hence, for the civil society to achieve its end of preserving life, each individual must agree to forfeit “free will” whenever it comes into conflict with the general will of society. The goal of this is to protect everyone’s property from the desires of others– free riders, thieves and con-men for example. The general will shall be embodied in the social contract, a constitution for example. The social contract and the civil rights it gives us are neither “natural” nor permanently fixed. Rather, the contract itself is the means towards an end — the benefit of all is only legitimate to the extent that it meets the general interest. Therefore, when failings are found in the contract, we renegotiate to change the terms, using methods such as elections and legislature; John Locke theorized the right of rebellion in case of the contract leading to tyranny. Locke’s use of rebellion was a primary influence on our founders when promoting the necessity of an American Revolution. Granted, it will be impossible to change what people desire, but the goal is to build the civil society with laws such that individuals would not gain the power to take more than what their labor truly deserves. These laws, the social contract, must represent the general interest of the whole people. To have an effective civil society is to have one body with one voice, the unity and consensus of the civil society must be preserved for there to be laws that are truly just. In the end, in the civil society built on the general will of its occupants, one will be as free as before in two ways: First, although the individual has restrictions on free will, there arises a new individual that identifies completely with the whole of the civil community. To say that this individual is free means that the will of the community is guaranteed. Through the will of the community, which treats all its elements equally, the people of the community gain the preservation of life, which was always the goal of free will. Second, the loss of individual free will is compensated by the preservation of the individual freedom to keep the products of one’s own labor, and this freedom is just as vital as free will was. Rousseau thinks that this can only happen in a relatively small community. All must have shared values and experience. He mentions the island state of Corsica as being an ideal place for such an experiment. * By setting the bar for creating laws so high, I fear Rousseau has left his populace at the mercy of the tyranny of the minority. When patience wears thin coercion of that minority becomes increasingly acceptable. ** To be a member of society is to accept responsibility for following its rules, along with the threat of punishment for violating them. Most of us are comfortable with laws punishing behavior that harms people because we are concerned about others harming us and don’t plan on harming others. In this way, society works by “mutual coercion, mutually agreed upon.” However, the philosopher Michel Foucault argued that this is a repressive conception that can easily be turned against the people by unscrupulous masters, declaring that in it we are all “potential criminals”. Indeed, Foucault criticized the standard concept of “criminal” and pointed out the possible interpretations of the relationship between crime, class struggle and insanity — thus, in a world turned upside down, “we are all virtual criminals”. We learned when Rousseau’s theory was attempted in practice, after the French Revolution for example, that there is a tendency to fear, search for and punish the bad apples who commit non-conformist acts. We observed accelerating levels of paranoia that proved to be the harbinger of totalitarianism, as evidenced by “the terror” during the French Revolution.